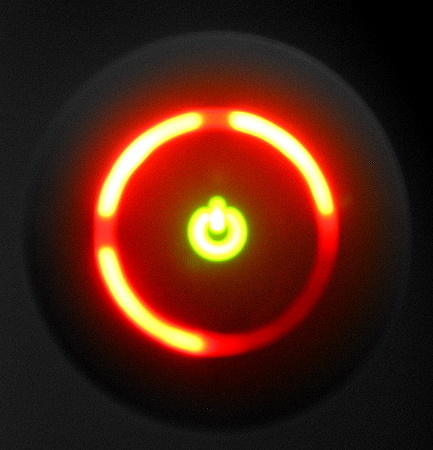 The lights around the power button on the XBox 360 indicate various errors. AV cable cannot be detected. Check the video cable connection. If the connection is OK then get a new cable. General hardware failure. Try restarting the console. If that does not work, remove video cable and hard drive then restart. Console overheating. Switch off and allow to cool. Make sure ventilation ports are not blocked. E64, E65, E66 are DVD drive errors. E67, E68, E69, E79 are hard drive errors. E73 is an ethernet port error. E74 is a video error. Possibilities include AV cable problems and HANA/GPU overheating.